WHY I FELL IN LOVE WITH CAMBODIA? I kept asking myself the same question over and over for the first few days, but I didn’t have a clear answer. I felt the place, the people, the smiles, the landscapes. Everything moved me for some reason.When I finally arrived at Siem Reap, the “final destination”, I was so tired that i could barely walk. That trip was one of the hardest, yet most rewarding experiences since I started my adventure. When I saw the real Cambodia. We slept at the airport to catch an early flight to Phnom Phen, when we landed I was already destroyed for the lack of sleep. None the less, I found myself happy to be with the locals. I could finally have a real taste of what living in Cambodia looked like. And it’s damn hard. During the journey I was looking outside the windows like a zombie, and maybe the extreme tiredness served me like a tool to receive everything on a deeper level. What I saw was something I wasn’t entirely prepare to face. 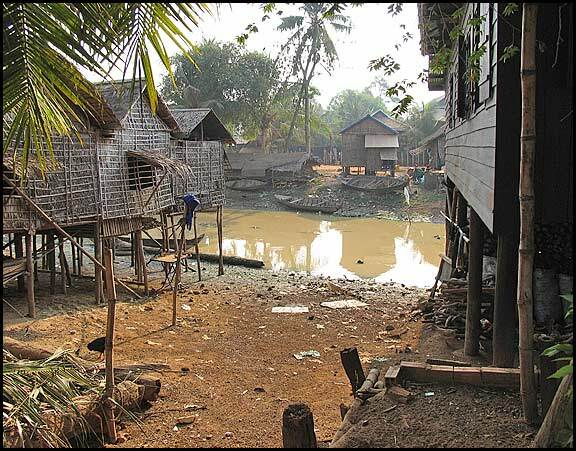 I knew that Cambodia was an extremely poor country, I’ve seen documentaries, read travel guides and blogs about the genocide and their difficult political past. But if there is a thing this trip is teaching me is that to fully understand things (being them your own emotions, the culture or people’s behavior) you need to experience it first hand. It’s been pretty shocking: kilometers of plain fields, with no vegetation whatsoever (dry season doesn’t help much I guess), and an infinite sequel of very poor houses made of old wood and palm tree leaves. Children searching for food in huge piles of trash, surrounded by stray dogs and chicken. No fresh water available apart for a big hole in front of each hut. It must have been filled with rainy water during the wet season but now it was reduced to a slough where pigs, chicken and dogs went to refresh themselves from the heat. The same water that the locals use for their everyday needs. The more I saw, the more I couldn’t believe how people could survive like that. Don’t they get ill instantly? What about children? I didn’t spot a single school for kilometers. Not a sign of what we call “civilization”. What was even more astonishing to me was that people kept on smiling at us. Constantly. Despite their condition, despite the hunger and everything they’ve been trough. I found these people just amazing. They have such an inner elegance, kindness and calmness that is disarming. Children in particular, they come to you and smile. Everywhere I went, there were children smiling at me, or trying to play with me. One night I was having dinner at a local street food place (where the owner remembered that I am allergic to spicy foods, so nice) and this little kid came to me and asked for my sprite. Of course I gave it to him. Feeling totally ashamed that the only contribution I could make was a silly sprite. On this first stay I couldn’t do any better than that, but I’d like to come back here to stay longer and try to really do something. Even if it’s a drop in the ocean. My time here is coming to an end for now. Tomorrow we are catching an early bus to cross the Cambodian Border and enter Thailand once again for 2 more weeks. And I already feel sad that I’m leaving. 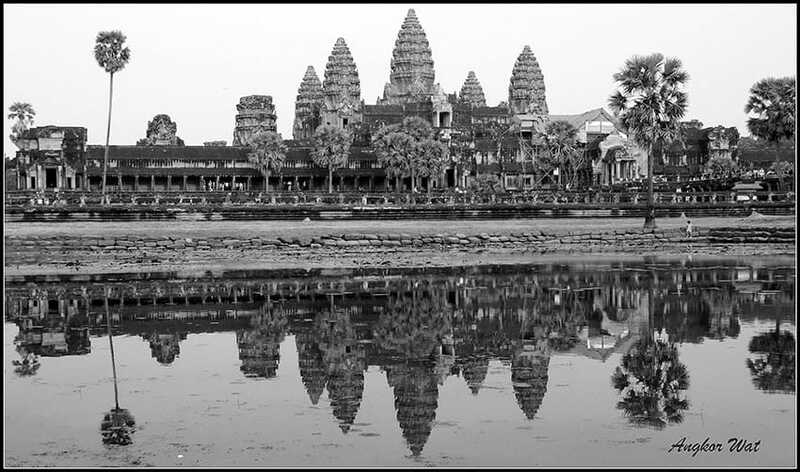 Not only for the beautiful Angkor Wat temples. 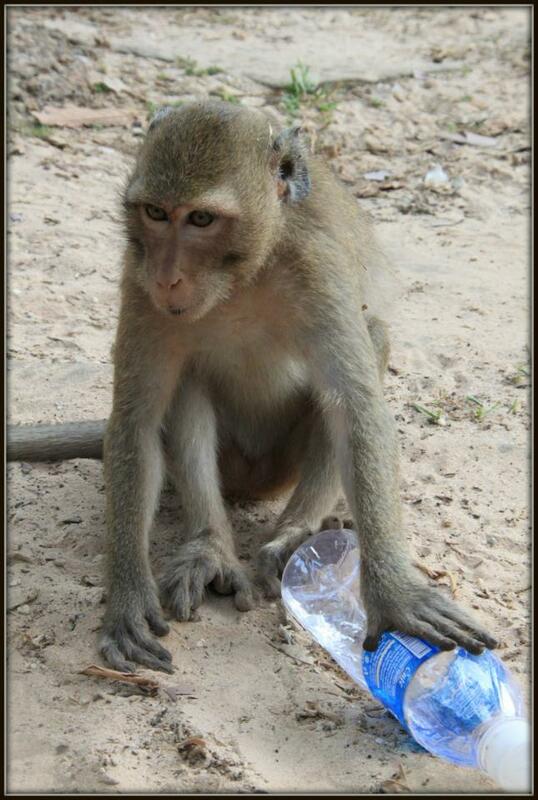 Monkey at Angkor Wat. Picture by Clelia Mattana, all rights reserved. or for being the unofficial photographer at a wedding in the temples…. 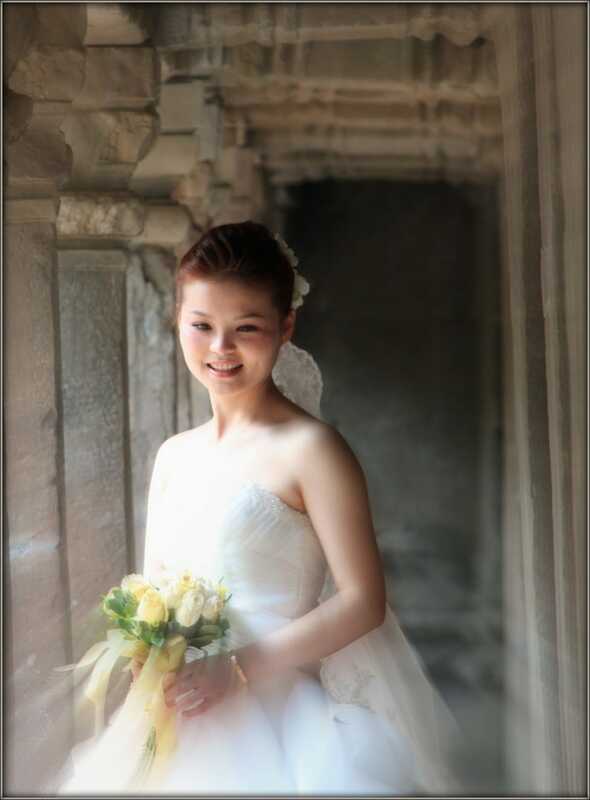 Bride at Angkor Wat Temples. Picture by Clelia Mattana. All rights reserved. What I’m going to miss the most is the people and their smiles. Which I’ll take with me for the rest of my journey, waiting to come back in this beautiful, controversial and difficult country. SEE YOU AGAIN ONE DAY CAMBODIA! Same here. Prolonged too even if it was damn expensive. Fell in love with it as well. The land, the food, the smiles, the girls. Definitely will come back. Nice pictures. You had wonderful experiences in Cambodia. Thanks for sharing with us. I feel the same for Cambodia. This place is cool but the thing that I enjoyed most during my one week stay, was the friendly nature of people. They always welcomes you with a fresh smile. Cambodia is just… genuine. With a long road ahead. But even though they know it, lots of people still seem happier than us… Regardless of its recent history filled with blood and death. I didn’t have the chance to visit Cambodia while traveling across SEA last year, but it’s definitively in the list after reading your post! I might teach there…did you visit Phom Phen as well?